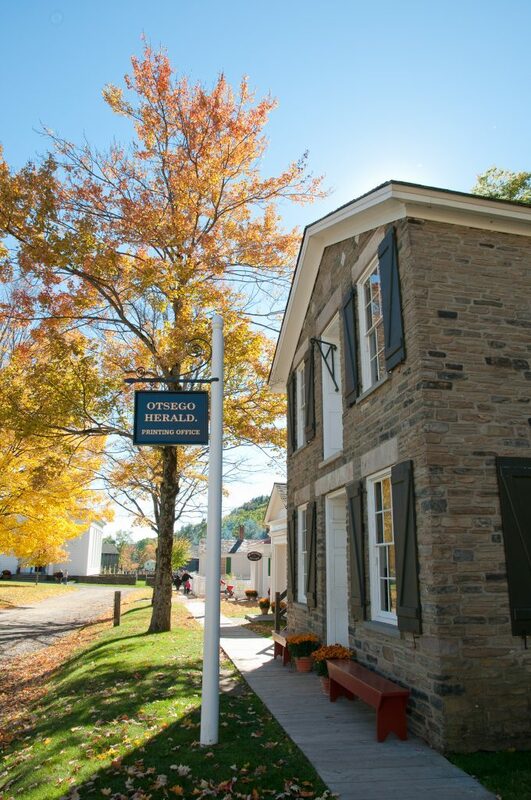 The Printing Office was originally located in the hamlet of Middlefield, formerly Clarksville, in Otsego County. The best clue about the building’s early history comes from the date stone over the second floor door which reads: BDN 1829. Tradition has it that Benjamin North, an early merchant, built the structure as a general store in 1828. North did not buy the property until 1833, and he sold it in 1840. Afterwards, the building served a variety of functions, possibly including printing. So You Want to Become a Printer? 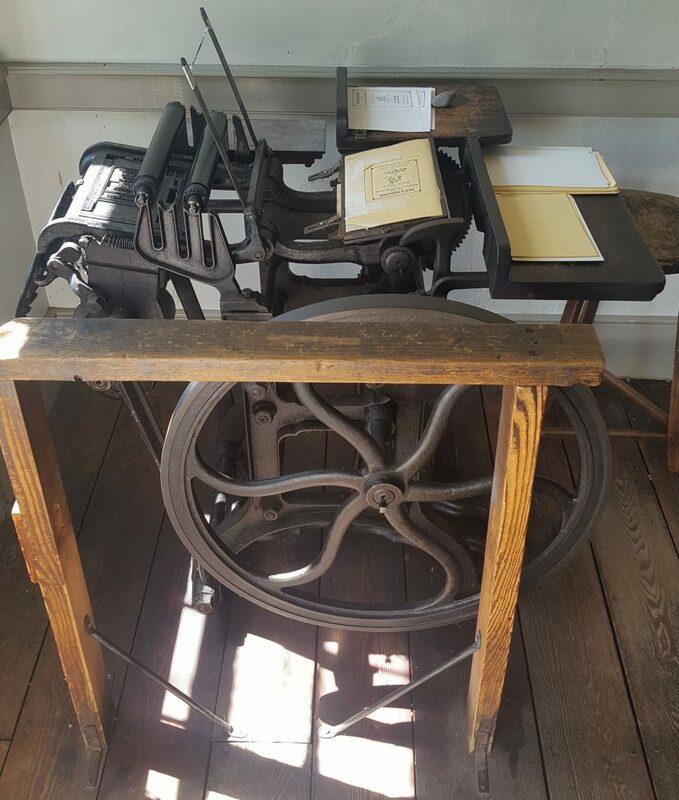 Printers followed a series of steps in their careers: starting as apprentices, moving to the position of journeyman printer, and eventually master printer. 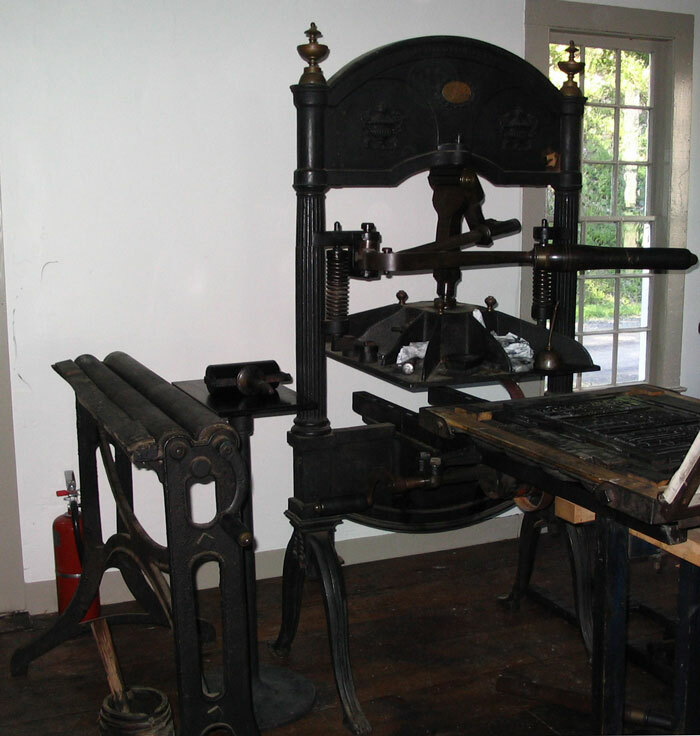 The master printer served as publisher, editor, reporter, salesman, and pressman. In addition to handling business matters, he also set much of the type, proofread, and supervised distribution. Journeymen set type and helped with other duties. 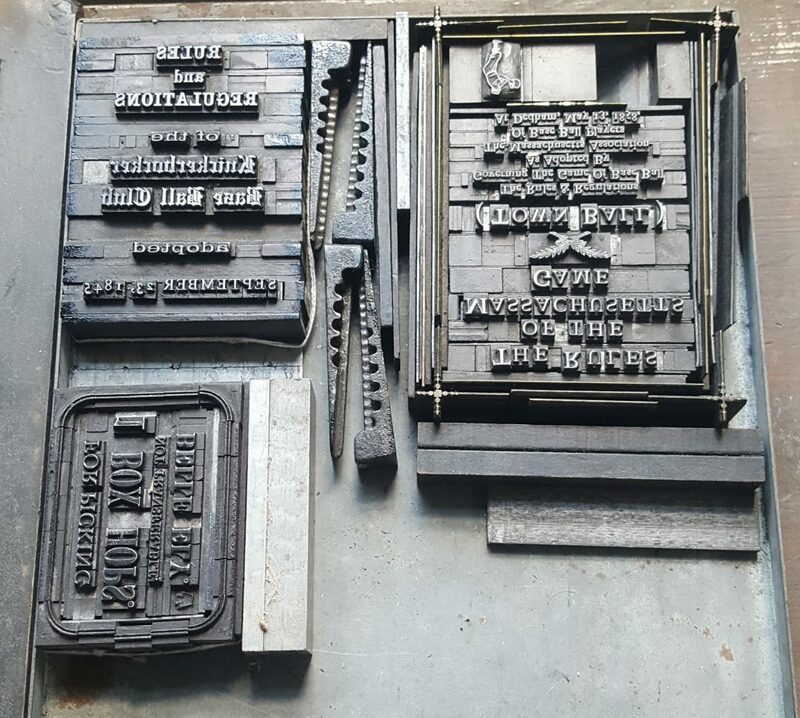 Many journeymen worked for several master printers at once, since rural printers generally did not have enough work to employ them full time. 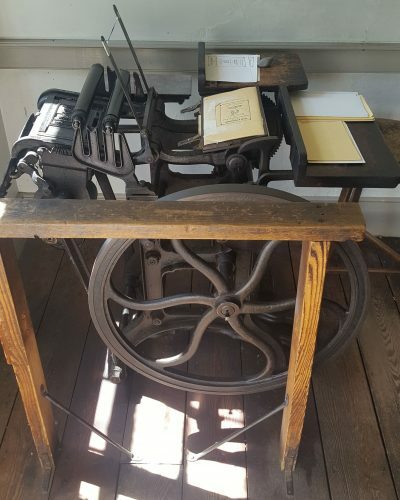 Many rural master printers worked only with an apprentice, customarily referred to as “the Printer’s Devil.” He ran errands, swept floors, built fires, delivered newspapers, cleaned ink off the equipment, and distributed the individual pieces of type back into the case after a job was completed. 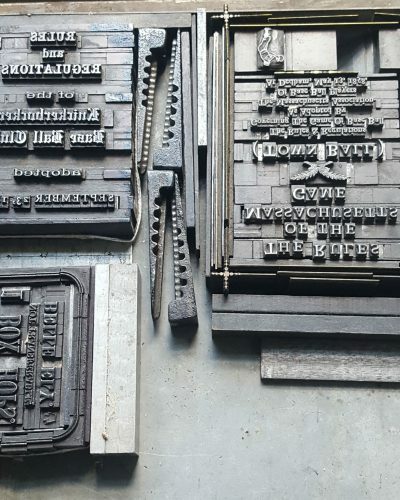 The apprentice’s parents or guardians would sign a contract with the master printer, which usually lasted from the boy’s completion of eighth grade until his twenty-first birthday. In exchange for his work, the apprentice lived with the master, who supplied his food, clothing, and medical costs, in addition to teaching him the trade. 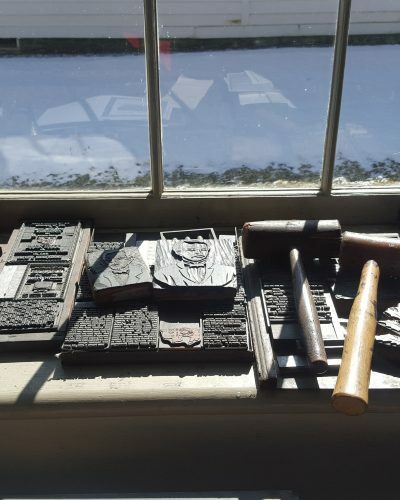 Printing in rural communities was an uncertain business. Many printers failed and lost everything. Income usually came from three sources: subscription rates, newspaper advertising, and job work. Newspapers were sold only by subscription, due to the cost of materials, and usually needed at least 500 subscribers to survive. Collecting money from subscribers was a common problem, and subscription rates rarely covered all the printer’s expenses. Instead, advertising was often the primary source of income. 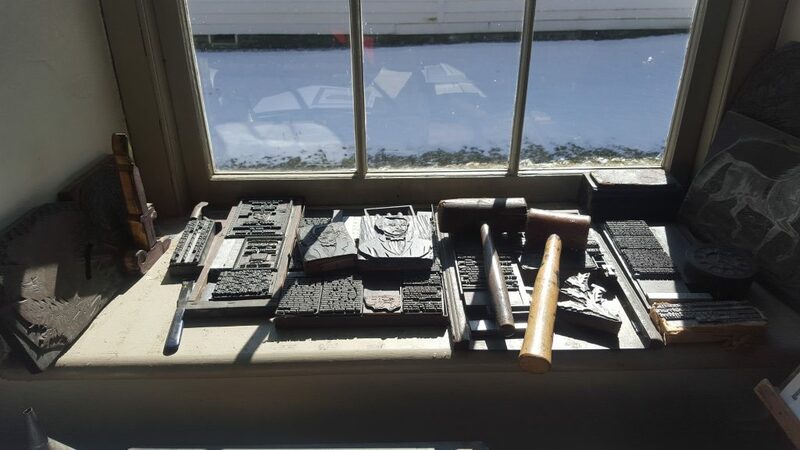 The Farmers' Museum Middlefield Print Shop is set to look like a nineteenth century newspaper office. Marbling is a decorative art form that was practiced in early America. In the 1840s in Upstate New York marbling helped to distinguish a book owner’s collection and detect missing parts. Marbling was done on vegetable tanned, not dyed, leather. Today, marble craftsmen practice the art much as they did in the 1840s. The historic method to make marbled paper involves a material called carrageen (made from moss) and requires a lot of complicated setup with chemicals, but it can be replicated with acrylic paints and shaving cream. Other than for its artistic value, marbling was done to easily detect missing parts, such as whether pages had been removed from a marbled book. Some scholars suggest that the Dutch brought marbling to America; others purport that the craft first began in China many years earlier and then came to the European continent, with immigrants then bringing the craft to America. Some believe the Chinese, having used Sumi inks on rice paper for their calligraphy, would have naturally viewed marbling as a viable offshoot. From China, marbling naturally moved on to India, Persia and then to Turkey, where others believe it traveled to the European Continent; first to Germany then on to France, Italy and Spain before coming to America. However the craft made its way to upstate NY in the 1840s, marbling was the last application completed prior to a book being made ready for market, as the printing and binding were done before a book was sent to a marbler. Marbling was done on vegetable tanned, not dyed, leather. Today, marble craftsmen practice the art much as they did in the 1840s. Make up comb by lining up the toothpicks on the packaging tape so that the ends are all even. Put the toothpicks close together or far apart to create different patterns. When you are finished placing the toothpicks, fold the tape over so that it is folded evenly in half. Add extra tape if a sticky side is exposed. Spray the foam onto the tray to make a small square about half the size of the paper. You can hold the tray vertically while you spray. Use the cardboard as a spreader to make a flat surface about ¼” thick. The surface should be flat and without bubbles. Place small dots or lines of different colors on the surface. Use the comb to create designs in the paint. Try to spread so that not too much white foam is showing. Remember not to mix too much or it will get muddy. Place a piece of paper on the foam, and press lightly so it contacts the foam in all places. Carefully pull the paper off, and set on the waxed paper. Let the paint soak for 2-3 minutes, then use the squeegee to clean the paint off in one straight pull.